I almost think that these are my favorite treat of all time. 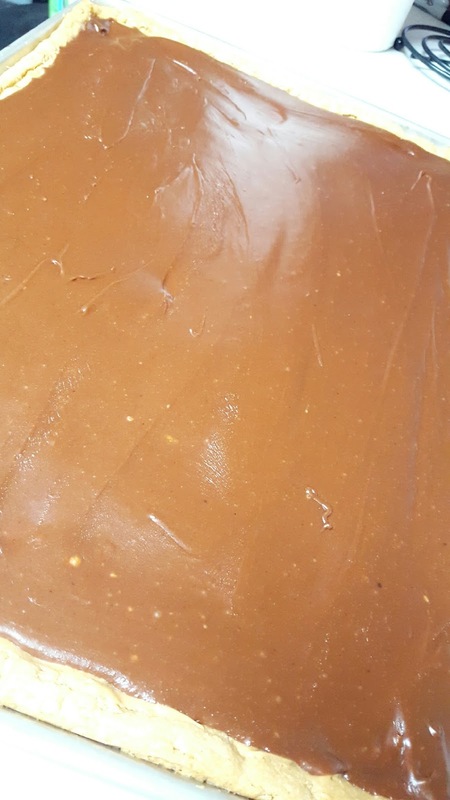 You can never go wrong when combining chocolate and peanut butter! I love it! Maybe that’s why I married a Reese! Anyways, these turned out great, I probably shouldn’t have but had these for breakfast for three straight days. They are definitely worth the calories always. 1. Preheat the oven to 350 degrees. Spray a non stick spray on a 18 inch by 13 inch cookie sheet. In a mixing bowl whisk together flour, oats, baking soda and salt. Set aside. 2. In a bowl of a stand mixer cream together brown sugar, sugar and butter until creamy. Mix in eggs one at time. Blend in the 1 cup peanut butter and the vanilla. On a low speed, slowly add in flour mixture and mix just until combined. 3. Put the cookie dough in the pan and press it down as evenly as possible. Bake for 12 to 15 minutes until golden. 4. Remove from the oven let sit for 5 minutes and then place the other cup of peanut butter on top. Let it melt until you can spread it around. 5. Melt the butter in a medium saucepan. Stir in cocoa, milk and salt and bring the mixture to a boil over medium heat. Remove from heat and whisk in vanilla, then stir in powdered sugar and mix until well combined. Immediately pour over the bars and spread into an even layer. 6. Allow to set and then cut into squares! Enjoy! 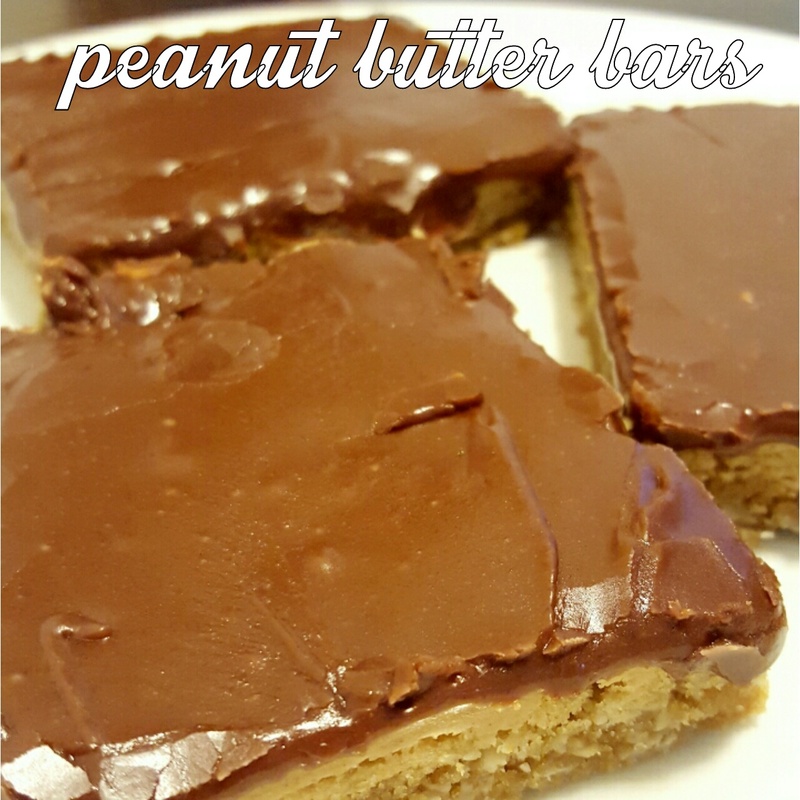 I do love peanut butter and chocolate together! 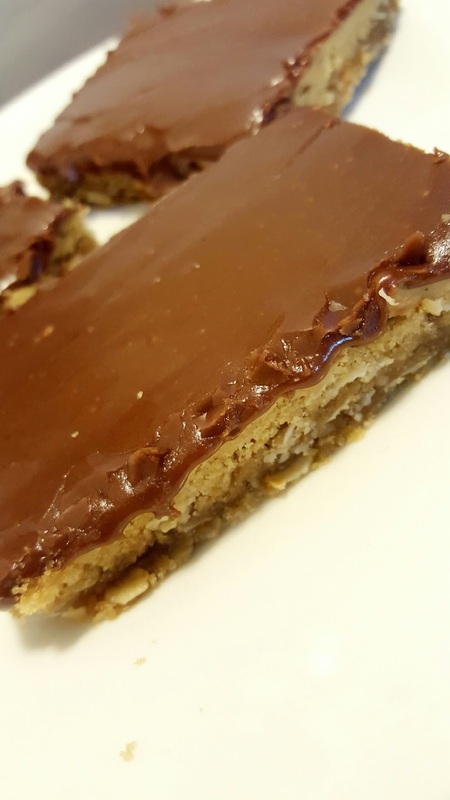 Your Peanut Butter Bars look fantastic and I like the addition of the oats too. Thank you for sharing them with us at Hearth and Soul. Pinned and shared.